Auckland is New Zealand’s international gateway and economic hub and its global reputation as the “City of Sails” means you’re never far from the sea. At the airport, SkyBus’ pick-up and drop-off points are right outside the domestic and international terminals. In the city, their airport or shuttle service stops near most of the major city hotels and transport hubs. SkyBus operates 24 hrs a day, 365 days a year, departing every 10 mins between 7am – 7pm (every 15 – 30 mins between 7pm – 7am). View more information on SkyBus. Auckland’s public transport network comprises inner city buses, trains, ferry or regional buses throughout the wider region. The main transport hub is located downtown, with the ferry terminal, Britomart train station and Link bus departure points all in this area. (Due to construction in the downtown area, some bus departure points have moved further up town). Find public transport services, maps and timetables at AT journey planner. Waiheke Island in the Hauraki Gulf is easily accessible from the downtown Ferry Building. It offers bushwalks, rural escapes, arts, beaches, restaurants, and wineries. 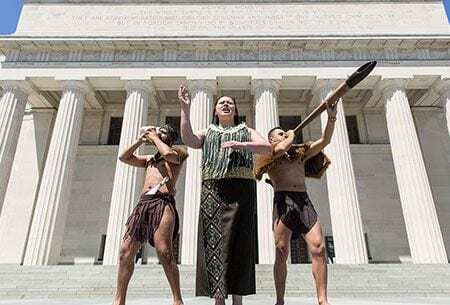 Manaia – Experience Māori culture at the Auckland Museum with a welcome dance, poi dance, stick game, weaponry display and a haka. Auckland Explorer Bus is a hop on, hop off sightseeing tour with full commentary, visiting Auckland’s big 14 attractions. 360 Discovery – Explore the Hauraki Gulf and its history, the Tiritiri Matangi island sanctuary, and Motuihe Island. Ananda Tours – Discover Waiheke Island (Waiheke means “cascading waters” in Māori) and its award winning wines along the wine trail, olive oils, arts and crafts, scenic and eco tours. Harley Tours New Zealand operates both Harley Davidson Pillion Passenger Tours and Harley Davidson Self-Ride Guided Tours. From majestic coastlines through to magnificent mountains, it would be no exaggeration to say that these are some of the finest motorcycling roads in the world. Goat Island Marine Reserve is renowned for its amazing marine life. It is New Zealand’s first marine reserve, also known as Cape Rodney-Okakari Point Marine Reserve, and is a great place to spend a day in the outdoors with friends and family. At Goat Island you will discover an abundance of New Zealand marine life and enjoy the experience of being surrounded by schools of playful fish and beautiful coral. 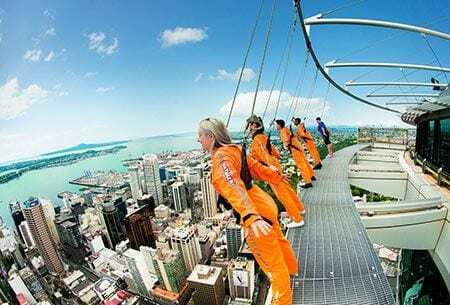 Sky Walk – Dare yourself to walk the circumference of the Sky Tower, 192 metres above ground, with no rails or balcony, just a safety harness on a ledge 1.2 metres wide. Sky Jump – Throw yourself off the top of the Sky Tower and plunge 192 metres in a controlled fall while wearing a safety harness. Auckland’s cosmopolitan urban culture is prominent at the newly redeveloped Wynyard Quarter, Viaduct Harbour and Britomart precincts, which offer harbourfront dining and nightlife. Bordering the CBD is Ponsonby to the west and Parnel to the East, which also boast many trendy shops and restaurants. The above information is provided as a point of interest only. The organising committee takes no responsibility for the services provided by any of the groups mentioned above, nor does it receive any incentives from businesses listed on this page. We suggest that you allow for a minimum of six weeks to have your visa processed by Immigration New Zealand or the applicable New Zealand embassy or consulate in your country of residence. In order to protect New Zealand and its environment, certain items are not allowed to be brought into the country, have restrictions for entry, or must be declared if they are deemed to present a biosecurity risk. These include food, plants, animal products and outdoor recreational equipment. You may risk a fine if you fail to comply. More about biosecurity.